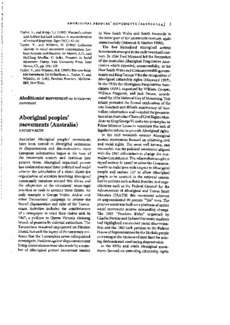 Australian Aboriginal peoples' movements have been central to Aboriginal resistances to dispossessions and discriminations since European colonization began at the turn of the nineteenth century and continue into present times. Aboriginal organized protest has coalesced around three political and social criteria: the articulation of a direct claim; the organization of activities involving Aboriginal community members around this claim; and the adaptation of the colonizers' socio-legal practices as tools to advance these claims. An early example is George Walter Arthur and other Tasmanians' campaign to reverse the forced dispossession and exile of the Tasmanians. Activities included the establishment of a newspaper to voice their claims and, in 1847, a petition to Queen Victoria claiming breach of promise by colonial authorities. The Tasmanians remained imprisoned on Flinders Island, but with the legacy of documentary evidence that the Tasmanians never relinquished sovereignty. Petitions against dispossession and living circumstances were also made by a number of Aboriginal protest movement leaders in New South Wales and South Australia in the latter part of the nineteenth century, again unsuccessfully (Attwood & Markus 1999).